Looking good Vegita-san. Ever thought to try and do an "original" story with the models down the road? I'd only dare attempt that if I could get an original writer to write it, and some classic voice actors to voice it, and someone to story board it. 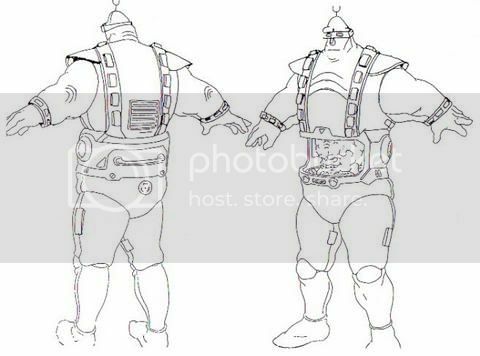 But that's a perfect storm that would never happen..
Ok, while this is looking great, I think the problem is that the mid-section of the body appears to be wider than Krang's belly compartment. It's hard to tell what exactly the ratio should be, but I would try to slim that upper body a bit. Assuming this is an unrealistic possibility, you could avoid the problem if you simply create a small self-contained story without dialogue that emphasized the visual action and maybe just used music and sound effects. A few more changes....head is still being worked on, fingers started... made Krang a bit bigger, will make the housing a bit wider..
Last edited by Vegita-San; 04-18-2011 at 08:12 PM. The proportions look much better from the front. Now you gotta give that android a neck! thank you yankee baseball for a little mutli tasking distraction.....the head still doesn't look right.... The back plate needs resizing... but what's wrong now? Last edited by Vegita-San; 04-19-2011 at 08:32 PM. The legs are still a WIP right Vegita? yep... getting closer... After Krang, It's Bebop, Rocksteady, a Turtle, Shredder, and Splinter changes.... Then it's on to NEW characters..
just done.. sometimes that doesn't always work though.. I see you've sunk the "collar-bone" area in your most recent update. Are you planning to fill that in with some more neck? Something more in the back of the head is definitely needed. he doesn't really have a neck..unless you consider that little bump to the right one..I thought that was more a shoulder area..
Yeah, that's what I meant, for lack of a better term. He definitely has a lot of mass between his head and his shoulders. last change of the night.. I tried to modify the shoulders and chin, and still doesn't look right...even putting it right up to the drawing..
the angle of the drawing... it looks OK from the front, near complete.. just not the side..
Last edited by Vegita-San; 04-20-2011 at 09:45 PM.